Did The Dog Eat Your Customer Service? Good customer service is essentially meeting the same expectations you have when you are a customer. This basic “golden rule” will never change. Most people would probably agree with the generic definition of good customer service: prompt and courteous attention delivered by smiling, friendly employees. But, is that it??? Doesn’t your business want to kick it up a notch? The cost of getting a new customer is often five times that of retaining an existing one, those that understand this, realize the importance of responding immediately to theirs. That being said, are you living up to the customer service expectations you have, with your own customers? Would you like to? We offer one simple rate plan: pay as you go and only for what you actually use. Respond to your clients 24/7/365 for less than the cost of a full-time receptionist. We don't charge additional fees for nights, weekends and holidays. No monthly or yearly contracts. We provide answering services, call center solutions, inbound email processing and customer service solutions for businesses in every industry. 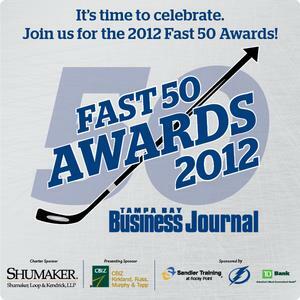 We're proud to announce that we've been nominated for the Tampa Bay Business Journal’s Fast 50 Awards!! The TBBJ is the Tampa Bay area TBJ publication that circulates over 9000 printed publications each month while also receiving more than 175000 monthly visitors to their website. The TBBJ holds 11 annual events including the Fast 50 Awards. The Fast 50 is a list of the fastest growing privately held companies in Tampa Bay with rankings based on percentage of annual growth over a three year period. Companies on the Fast 50 list must meet the following criteria: the company must be privately held and locally owned, it must be headquartered in Hernando, Hillsborough, Manatee, Pasco, Pinellas, Polk or Sarasota counties, the company must have been in operation since 2008 or prior, and the company must have had annual revenue of at least $1 million in 2011 with no revenue requirement for the years 2009 and 2010 as long as revenue has grown each year. Each year, the final rankings are revealed at an awards luncheon with the top 5 companies receiving special recognition. If you'd like more information about AnswerFirst, our answering services or virtual receptionist solutions, visit our website or call us today at 1-800-645-2616.